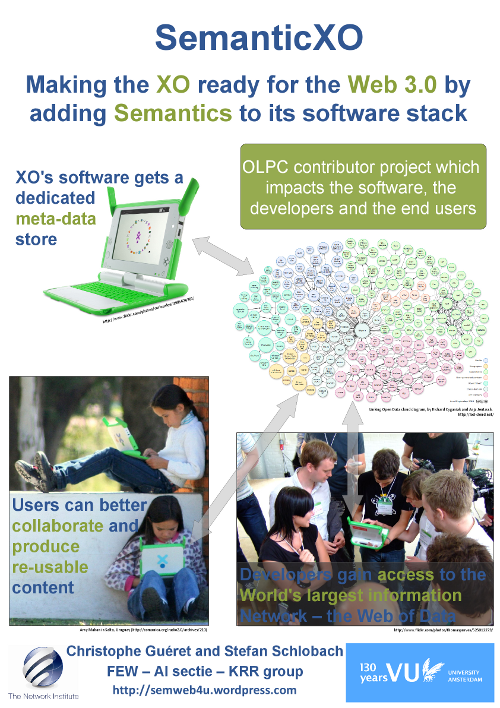 The Botari application from the LarKC project has won the Open Track of the Semantic Web Challenge. Botari is a LarKC workflow running on servers in Seoul, plus a user frontend that runs on a Galaxy Tab. The workflow combines open data from the city of Seoul (Open Street Map, POI’s) with twitter traffic and combines stream processing, machine learning and querying over RDF datasets and streams to give personalised restaurant information and recommendations, presented in an augmented reality interface on the Galaxy Tab. For more info on Botari, see either the website, or the demo movie or the slide deck or the paper. WebPIE performed forward inference over up to 100 billion triples (yes, that’s 10^11). Our about-to-be-published QueryPIE can do on the fly backward-chaining inference at query-time, over a billion triples, in milliseconds, on just 8 parallel machines. Now, a year later, we’re breaking another speed record, but this time for “backward chaining“: not doing all inferencing up front, but doing the inferencing “on the fly”, at query time, as and when they are needed. Until now, backward-chaining was considered to be unfeasible on very large realistic data, since it would slow down the query response time too much. Our paper at ISWC this year shows it’s not all that impossible: on different real-life datasets of up to 1 billion triples, QueryPIE can do on the fly backward-chaining inference at query-time, implementing the full OWL Horst fragment with response times in millisecs on just 8 machines. Data2Semantics aims to provide essential semantic infrastructure for bringing e-Science to the next level. How to share, publish, access, analyse, interpret and reuse data? Data2Semantics is a collaboration between the VU University Amsterdam, the University of Amsterdam, Data Archiving and Networked Services (DANS) of the KNAW, Elsevier Publishing and Philips, and is funded under the COMMIT programme of the NL Agency of the Dutch Ministry of Economic Affairs, Agriculture and Innovation. The China Higher Education Press will publish a LarKC book in Chinese. This book will appear in the book series of Web Intelligence and Web Science (http://www.wici-lab.org/wici/WIWS/) . This Chinese LarKC book consists of two parts: Technology part and application part. The technology part covers the topics of LarKC platform, development guide and various plugins and workflows. The application part covers the topics of Linked Life Data, semantic information retrieval, urban computing, and cancer study. The main contributors of the book are six Chinese researchers in the LarKC Consortium, who are from Amsterdam, WICI, and Siemens. See the appended text below for the detail. The book is expected to be published by the end of this year. Here is the outline of the book content and the main contributors. The LarKC folk at the German High Performance Computing Centre in Stuttgart did a rather nice write-up on LarKC from a high-performance computing perspective, intended for their own community. Find the relevant pages here. A LarKC workflow for traffic-aware route-planning has won the 1st prize in the AI Mashup Challenge at the ESWC 2011 conference, held this week on Crete. calendar information (week days and week-end days, holidays, etc.) from Milano Municipality and from the Mozilla Calendar project. These are used in a batchtime workflow to predict the traffic situation over the next two ours and in a runtime workflow to respond to route-planning queries from users. the competition entry is at https://sites.google.com/a/fh-hannover.de/aimashup11/home/traffic_larkc. This LarKC workflow shows that Linked Open Data and the corresponding technologies are now getting good enough to compete with what’s possible in closed commercial systems. Congratulations to the entire team that has made this possible! V2.5 is fully compliant with the LarKC final architecture. You can now develop your workflows and plugins, and be assured that future updates won’t change the main APIs. The Management Interface, which makes it possible to run LarKC from your browser, has an updated RESTful implementation. Besides RDF/XML, workflows can now be described in very readable N3 notation. The endpoint for submitting queries to LarKC is now user-definable, and multiple endpoints are supported. 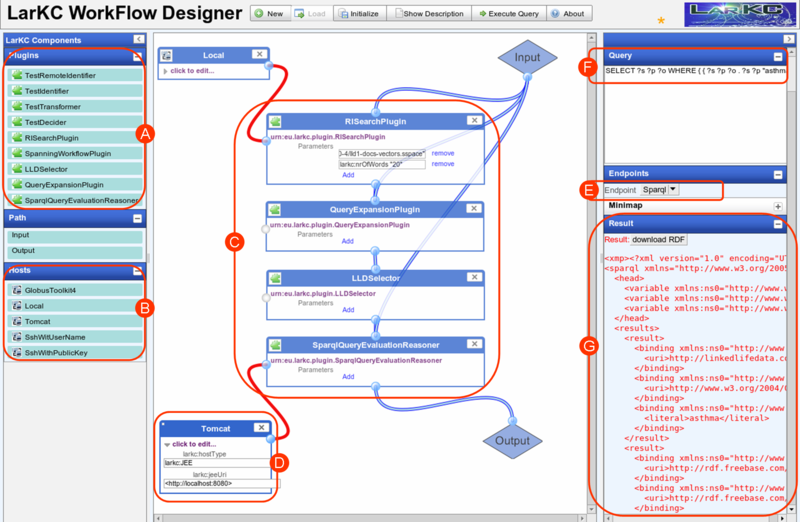 A WYSIWIG Worfklow Designer tool that allows you to construct workflows by drag-and-drop, right from your browser: click on some plugins, drag them to the workspace, click to connect them, and press run! (see screenshot below). An updated plug-in wizard for Eclipse. We have thouroughly updated the distributed execution framework. Besides deploying LarKC plugins through Apache (simply by dropping them in your Apache folder), it is now also possible to deploy plugins through JEE (for webservers) or GAT (for clusters). The WYSIWYG Workflow Designer allows you to specify remote execution of a plugin simply by connecting a plugin to a remote host. Templates are provided for such remote host declaration. Last but not least, we have considerably improved documentation and user manuals, including a quick-start guide, tutorial materials and example workflows. As usual, you are encouraged to use the discussion forums and mailing lists served by the LarKC@SourceForge development environment.